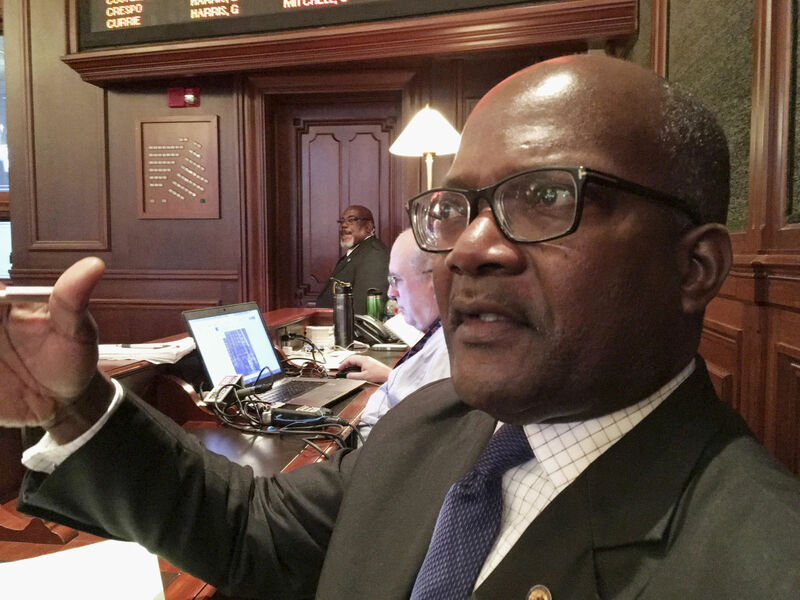 Associated Press Photo: State Rep. Al Riley, D-Olympia Fields, discusses an issue in May on the House floor in Springfield. Riley, chairman of the State Government Administration Committee, is sponsoring a resolution calling for an audit of a $94 million, 10-year contract with Atlanta-based Morneau Sheppel for an online insurance portal. The Associated Press reported in June that the company was the only bidder for the work, was allowed to forgo state law requiring participation in the contract by minority- and women-owned firms, and faced complaints from state agencies and state employees that the online system didn’t work. SPRINGFIELD — A resolution headed to the Illinois House floor Wednesday would require an audit of a $94 million online insurance portal and the performance of the only company that responded to the contract request. The State Government Administration Committee unanimously voted for a review by the auditor general of the 10-year contract with Atlanta-based Morneau Shepell following an Associated Press report in June. The AP reported that the search for a contract lasted just three weeks, Morneau Shepell was the only company to seek the work, its bid came in at just one-third of the state’s estimated cost, and the company was allowed to forgo requirements in state law for ensuring minority participation. Spokespeople for Morneau Shepell and the agency that awarded the contract, the Department of Central Management Services, didn’t immediately respond to requests for comment. The idea was to move the state away from a paper-based system administered by dozens of employees. None of those workers was laid off; instead they were assigned to “higher-level” duties, officials said late last spring. The digital format was supposed to allow state workers and retirees to sign up for, change or adjust coverage, or submit claims online. But employees complained of a malfunctioning website and mysterious, unexplained changes in coverage or payroll deduction. The agency administers benefits for public-school teachers, including 70,000 retirees on Medicare, yet Morneau Shepell was not prepared to deal with Medicare. “It’s not just the way it was let,” Riley said. “There were a lot of problems with the portal. The department would not say who made the decision. Co-sponsoring the measure is Barrington Hills Republican Rep. David McSweeney, who noted that the Morneau Shepell deal is one of several under GOP Gov. Bruce Rauner’s administration that drew only one bidder and that lawmakers or others are reviewing.